Do you ever say that to yourself? And as a quick follow-up, it would be an understatement to say I was overwhelmed by the response last week. It wasn’t just the volume of comments and emails, but the depth of the stories and experiences shared. Eric and I feel like we are coming to know you better—seeing into your hearts. You are incredible, beautiful people with important goals and a whole lot going on in your lives. We appreciate you opening up to us and to each other. Truly. 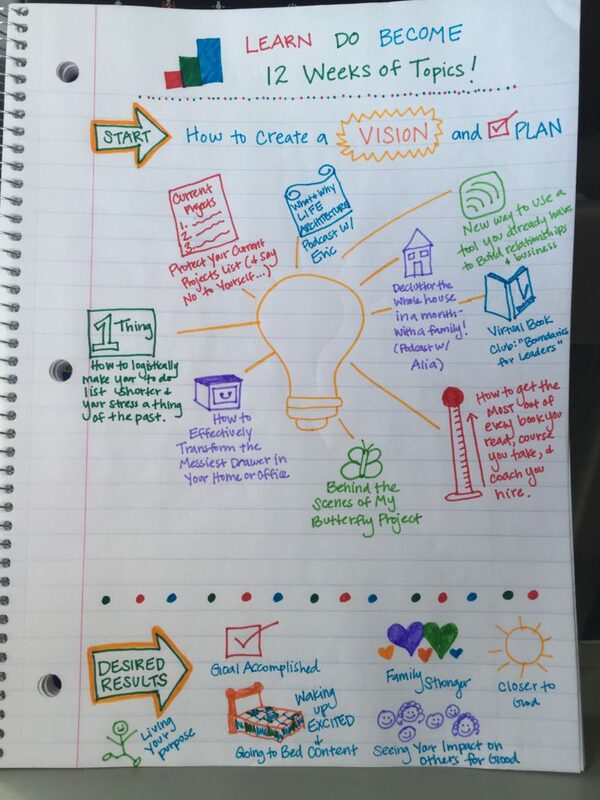 Now to get started creating a vision and plan for that big project, I’m going to outline a six-step process that you can either replicate or adapt. Let’s dive in! I love this idea from Joe Vitale’s book The Key. Take two minutes and write down what you don’t want the outcome of your project to be. My project is to write and podcast regularly over the next 12 weeks here at LearnDoBecome. I love sharing things I believe can help others, and this process is really important to me. How about you? Can you take a moment and identify what you don’t want your project outcome to be? STEP 2 – Identify What You DO Want! When your project is “wildly successful” in 12 weeks, what will it look like? Three months from now, I want to have between 8 and 12 posts or podcasts published on LearnDoBecome that (a) are created with my heart, (b) give you easy ways to take action on your own goals (getting you results), and (c) lay a strong foundation for the exciting work ahead of us here in this community. As a side note on “c”–I wish you could hear the conversations Eric and I have about you. We talk about you more than you know–how much we admire you and how we want to do the best we can to help your lives feel easier and happier. There is a lot ahead, and the whole vision isn’t going to appear in 12 weeks, but I’ve learned that it’s absolutely not about the speed by which you accomplish your mission. It is about how willing you are to ask for help (Learn), take inspired action (Do), and let those beautiful experiences shape who you are (Become). This isn’t going to be “perfect.” We just do it as well as we can–leaving room for refinement and added insights. How can I help our community members to succeed and get quick wins? Which posts will I feel excited to wake up and create? How could I involve others, so this builds relationships in the process? This took about 30 minutes, and while it will likely evolve as I go, I felt like I was coming alive again!! If you were to divide up your project into 10-12 generally equal parts, what would that first part look like? This is like putting the next stepping stone in place. It’s telling our brains that we’re pacing ourselves and we won’t forget to come back to the project. Next week, I am going to brainstorm and create another post. My calendar will remind me. I don’t have to worry about it this week. Making a calendar trigger literally takes 30 seconds. But try it. It works. There is an added element of strength and confidence when you know you are not doing this alone. We know that all of you are carrying heavy responsibilities. You are finding jobs, writing books, raising children, getting rid of clutter, healing relationships, growing businesses, getting bills and budgets organized, moving, leaving bad situations, trying to create good situations, overcoming anxiety or depression, establishing new routines—and a ton of other worthwhile projects. We are totally cheering for you. And while I don’t know exactly how it works, I know without a doubt that when you pause for just a moment, acknowledge that you need more strength than you currently have, and ask for added support from a higher power, you’ll see a way to receive it. I know we’re on opposite ends of this screen. I know you can’t see me. And it’s SUPER easy for you to move on and pretend you were never here. But what IF this works? What IF you start to get results and feel relief and finally realize that vision of who you’re meant to become. I like how that feels. And I think you will too. Today is the day to be brave. You can do this. We’ll be back in the next week or so with some additional ideas we hope you’ll love (not all about project planning), but in the meantime, we encourage you to go through this six-step process outlined above and report back in the comments to let us know how it went. Good luck! This is incredible! April, I so want to attend a planning session with you as the teacher. I read the steps and then see your illustration and think WOW! This is the part of my goal setting that is missing. I can set a goal but am an absolute failure at breaking down the steps and planning for them. 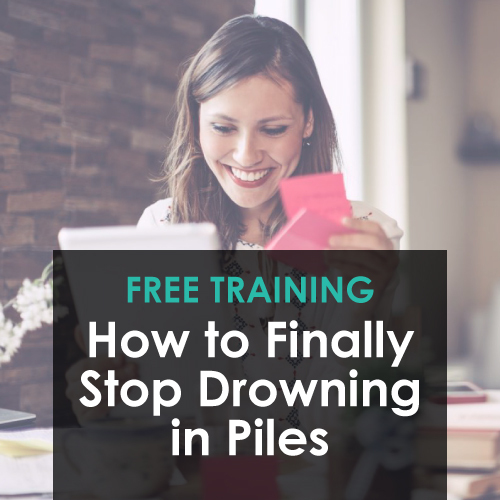 Yes – I can clean a drawer, organize a closet, set up a filing system – but set a goal to be done in 3 months or even a month out … This has always been very hard for me, if not impossible. Would you consider have a webinar as a one time – goal setting and breaking it down into tasks. I was a project leader at work for years, but in that case it was so much easier to see what had to be done, who had to be responsible for things, and set up the tasks and reporting. This life on a personal level is a lot harder. Me too! 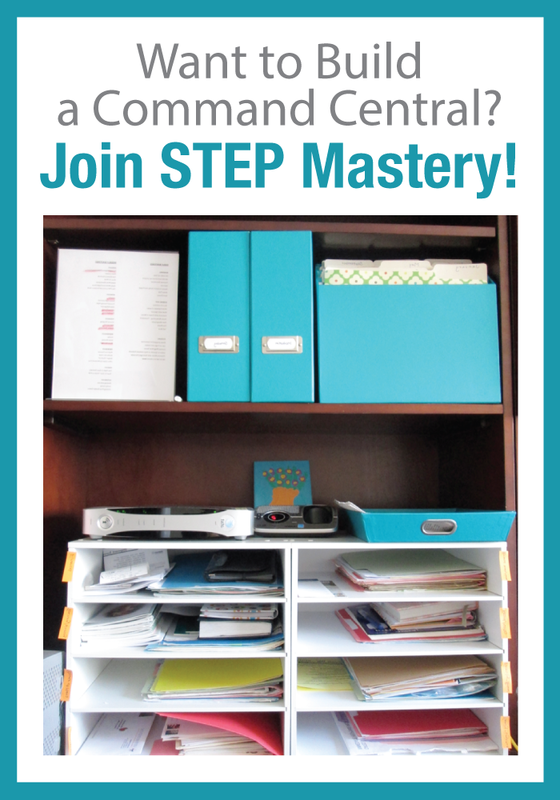 I struggle with organization & these processes really help! Ditto on Janes Reply! This wonderful adventure of life as a leader of my daily destiny and my families’ takes more bravery than I imagined! I am going to refuse to take the “busyness” route anymore, with no intentionality in my “busyness”. That is in my past! Visions without an action plan and tasks to step off are just fantasies lost in time! The steps do not have to be “overplanned” or “analyzed” just identified, (in color preferably as April has)! Very intrigued by the “declutter your whole house in a month” podcast….we’re moving next year, and getting it done in even 6 months is truly daunting. Would love to figure out how to tackle this mountain (of junk!)! This is my daunting desire…. to clean and deciliter our whole house. Doesn’t seem possible in even a year’s time, much less a month!!! In this whole process, I have to change me to make it happen!!! Thank you for ALL your helpful advice! I love getting emails from you! These topics look wonderful! I’m especially excited to hear about your butterfly project and also how to get the most out of books and courses. Thank you for everything you do! This is pure inspiration. Thank you, April. I would be interested in how to handle going through boxes of papers that have been archived in our basement. Nothing in there is urgent, but there are gems of family history in there I don’t want to lose, so I must go through them. Also I inherited boxes of papers from my parents that I also need to get through. I think that would be a really good podcast idea. I’m giving it a try by email. I don’t seem to be able to match up the webinar times with central time and working full time. I recently overcame one of my hurdles, sorta, with two more to go. I can do this. I want to do this. I will do this. I love these ideas. I’m not really embarking on a project, but rather a transition, as we recently welcomed our 4th baby into our family. I was thinking about this post and set a vision for the next 3 months: a happy family (enough sleep, enjoying time together, and meeting every family member’s basic needs, including mine), a tidy home (just keeping up with my basic housework routines as a messy house bugs me), and eating simple healthy food. In that priority order, and keeping things as simple as possible, without worrying about taking on any other projects or responsibilities. Just setting this vision has helped me feel more intentional and peaceful about what I need to do and how I need to spend my time the next few months. I look forward to coming back to this post later this year when I am able to take on a project I’ve been wanting to do. Sounds like a great plan. Very intentional & simple. If you are like me, you will need to keep reminding yourself of this plan as other things try to jump in to take over!! April, I get the whole STEP breakdown. But what do you do when each STEP haa STEPS? My one single most important project consist of multiple projects with multiple steps! How do you develop a plan no gram of STEPS and not get overwhelmed?